There’s a lot of debate about whether or not Grass-Fed beef is really worth the extra cost compared to Corn/Grain-Fed Beef. Then there is the question of animal cruelty. Grass fed cows obviously live a much healthier and more humane lifestyle. Of course, Factory Farming has been around for decades. These mechanical operations are designed to provide a year-round supply of food at the lowest price possible so speed to marketplace is critical. Meat with less nutritional value. When you compare feedlot meat, with meat from grass-fed beef, bison, lamb or goat, they have less total fat, less saturated fat, less cholesterol, and less calories. Grass fed beef also has more vitamin E, beta-carotene, vitamin C, as well as omega-3 fatty acids and “conjugated linoleic acid” (aka—CLA), which is known for its fat burning properties and health benefits. – Saturated and monounsaturated: Grass-fed beef has either similar, or slightly less, saturated and monounsaturated fats. – Omega-6 Polyunsaturated Fats: Grass-fed and grain-fed beef contain very similar amounts of Omega-6 fatty acids. – Omega-3s: This is where grass-fed really makes a major difference, containing up to 5 times as much Omega-3. – Conjugated Linoleic Acid (CLA): Grass-fed beef contains about twice as much CLA as grain-fed beef. This fatty acid is associated with reduced body fat and has other beneficial effects. – Vitamin A: Grass-fed beef contains carotenoid precursors to Vitamin A, such as beta-carotene. – Vitamin E: Grass-fed beef contains more of this antioxidant that sits in your cell membranes and protects them from oxidation (i.e. damage). – Micronutrients: Grass-fed beef also contains more potassium, iron, zinc, phosphorus and sodium. Animals raised in feedlots or cages, also deposit large amounts of manure in a very small amount of space. The manure must be collected and transported away from the area, which can be very expensive. In order to cut costs, it is dumped as close to the feedlot as possible. As a result, the surrounding soil is overloaded with nutrients, which can cause ground and water pollution. Conversely, when animals are raised outdoors on pasture, their manure is spread over a wide area of land, making it a great source of organic fertilizer, not a “waste management problem. While the biggest obstacle to switching to pastured animals is the cost, you can see that from a nutritionally, humanely and environmentally-sound perspective, it may just be worth it. I know our grocery bill is higher than ever from buying grass fed meats and organic produce, but we always view it as an investment in our health and our family rather than seeing it as an expense. Now that we’ve made the case for buying grass-fed, here’s a great-tasting high-protein lunch idea. Quick to make and with a side of broccoli (or other cruciferous veggies) makes an amazingly balanced meal chocked FULL of protein, friendly fats, and other beneficial nutrients. 1 serving grass fed beef (85% lean-15% fat), 4-6 oz. cooked (women), 6 -8 oz. (men), cooked. 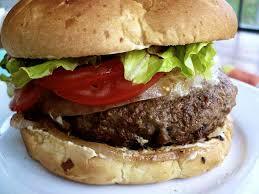 1: Season the grass fed beef patty with dry ingredients of your choice. 2: Pan fry (you can also grill, but pan frying grass fed holds in more of the fats and flavor). 3: Serve with broccoli and salad….enjoy! And if you’re still in the camp that believes red meat is bad for you—remember it all depends on the type of red meat. You often hear things like red meat causes heart disease, cancer, and rots your colon… but the actual published research proves once and for all this isn’t true. In 2010 there was a huge study published where researchers gathered data from twenty studies done on over 1 million people. The results? They found NO link between consumption of unprocessed red meat and heart disease . The key here is to make sure you eat unprocessed red meat because there’s actually a strong link between excess consumption of processed meat and these particular diseases.